Life with a toddler is busy. Getting out of the house, mealtimes and bedtimes are each a full production involving several steps. Does it make your head spin to imagine these productions getting even longer because your toddler wants to do things like put on his shoes, feed himself, and pre-brush his teeth before you do the actual job? Encouraging age-appropriate self-care tasks can test your patience, but it’s essential for your toddler’s emerging sense of independence. Independence gives us a sense that we are not helpless, but rather in control and responsible for ourselves and our actions. 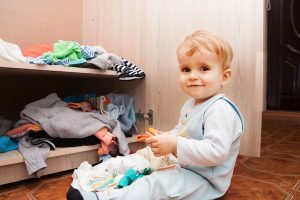 Even the simple act of putting a dirty shirt in the hamper helps your little one feel capable, builds his self-esteem, fuels his desire to learn and grow, encourages self-reliance, and let’s him feel like a contributing member of the family. Self-care tasks also benefit other areas of development, like executive function and fine motor skills. Learn about age-appropriate self-care tasks. Chances are your toddler will let you know when he wants to do something by himself. As long as it doesn’t involve kitchen knives or another perilous activity, follow his lead and offer help if he needs it. This article is a great resource for self-care activities through age 2. You can also scroll through our BabySparks app for self-care tasks by month, as well as independence-promoting activities you can do with your toddler. Offer choices. Part of a child’s drive to do things on his own is a desire to feel in control. If he wants to wear shorts outside on a cold day, you may be able to avoid or diffuse a meltdown by offering him reasonable choices: “Do you want to wear these blue pants or these green pants?” That way he can still take ownership of the final decision. Make self-care accessible. Put your toddler’s pajamas in a low drawer in his room so he can pull them out himself at bedtime. Or put some of his plates and cups in a low cupboard in the kitchen so he can retrieve them himself at mealtimes. Allow extra time. If your toddler’s bedtime routine usually takes 30 minutes, try starting a little earlier. This is a win-win for both of you: He’ll have time to successfully complete a task and you’ll have room for patience while he does it. This goes for mealtimes, picking up toys, and any other daily routine in which your toddler can play a role. Balance stepping away and stepping in. You may have to sit on your hands to keep from grabbing your little one’s fork as he tries again and again to stab a piece of banana, but give him a chance (or several). Tasks like these involve fine-motor skills that take a lot of practice to master. There will also be times when you want him to do something by himself and he fights it. Try compromising: “I’ll take off this sock and you can take off the other one.” Sometimes he will flat out refuse and you’ll have to choose your battles. He may be tired, or simply having a bad day. Like so many other areas of parenting, overall consistency is what matters. Be supportive. Learning to do things by himself will involve frustration, messes, spills and mistakes. As he tackles increasingly difficult tasks, you want him to persevere. Support and praise send the message that mistakes are part of learning and can be overcome. The self-care learning process can feel long and tedious, but remember that little everyday tasks teach your toddler big lessons about self-reliance, helpfulness, and responsibility.